Yep... I am still exploring different subscription box options. I have subscribed to beauty, pet and food boxes. I am a coffee addict... A very committed coffee addict. I've been exploring options available on the web. There are great local coffee bean roasters in Halifax but I always like to keep looking, searching for different roasts, styles and flavours. I tweeted out about 2 months ago asking people if they've ever tried coffee bean subscriptions and MistoBox kindly offered to send me some to try. I'm not silly... Of course I took them up on it! They directed me to a new website to test drive and decided to select 4 smaller bags to try different beans. The site asks you some questions to better help guide what gets sent to you. Pretty sleek! They did not ask me to review the product in exchange for the free coffee but I thought it might be interesting to others how the service works and the quality of beans supplied by MistoBox. Their website has lots of tips for brewing beans using different methods (French Press, Aeropress, Chemex for example). In addition to the coffee subscription there is a shop to buy coffee equipment and beans of course. In the US it is $19 & $25 respectively. International is $30 and $40. I decided to select the Awesome package with 4-50 grams bags of whole coffee beans. 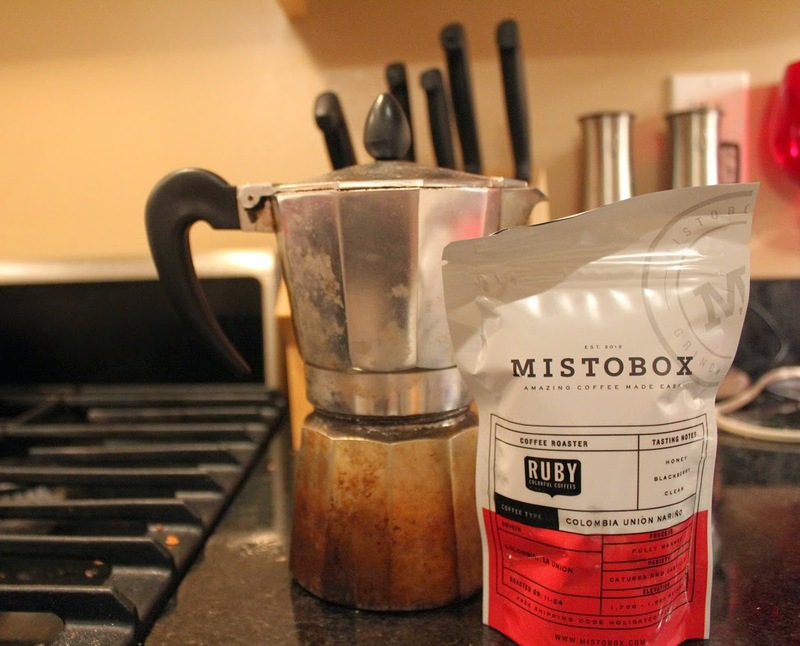 Mistobox leads you through a number of questions to refine your coffee tastes and match you with a coffee curator who will select coffee on your behalf. First up is Ruby Coffee Roasters with their Colombia Union Narino. Floral aromatics, tart blackberry, honey sweetness and a lingering cocoa finish. Second is Coava Coffee Roasters with Honduras Las Capucaas. Dominated by baker's chocolate, complimented by red currant. I ground the Coava and had 3 cups this morning - It was mild and delicious. Third package was Bow Truss Coffee Roasters and their Sumatra Sidikalang Tabu Jamu. These beans are typically processed using the "semi-washed method" giving earthy, herbal and molasses like flavours. The final packet was the Ethiopia Kochere from Portola Coffee Lab. Delicate with subtle fruits like peaches and nectarines. I plan on subscribing for a 3 month stint to see if a) the coffees are truly excellent b) is it worth the $. I am very interested in trying all different kinds of beans and roasters so this may be an excellent way of doing it. PS. They recommend using 16.5g of coffee for every 265g of water for the perfect cup of coffee. If you are interested in subscribing, go to https://one.mistobox.com/skipper and enter the password discovery to get 50% off your first coffee shipment.